With winter's chill comes the urge to crank up the thermostat, but that leads to an icy feeling when you open the utility bill. 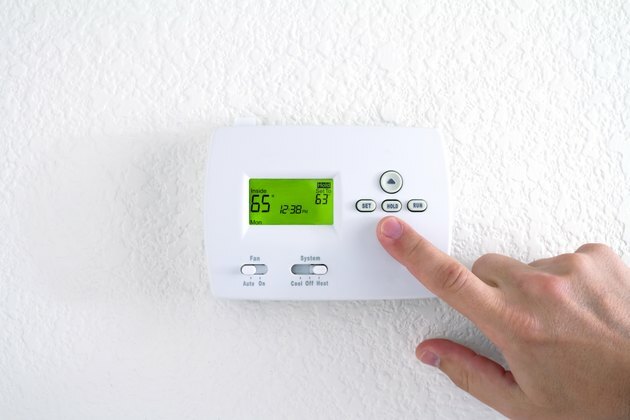 Before you reach for the temperature regulator, check out what experts, including the U.S Department of Energy and the Consumer Energy Center, consider to be the best settings for savings and comfort -- depending on residents' ages. A homeowner adjusts their thermostat. Ultimately, how warm you keep your home during the colder months hinges on personal comfort, not the national standard. But by setting the thermostat to an on-average comfortable 68 degrees Fahrenheit during awake time, and lowering it to about 55 degrees for eight or more hours each day -- before you go to bed or when everyone leaves for work or school -- you can save from 5 to 15 percent in heating costs. The best temperature for a home with an infant is between 68 and 72 degrees. Cover the crib mattress with a winter-friendly, well-fitting flannel sheet, and dress your baby in a warm, one-piece sleeper or sleep sack; blankets in the crib are a suffocation hazard. Elderly people can lose the ability to generate sufficient body heat, leaving them vulnerable to hypothermia, even indoors; keep the thermostat set to at least 68 degrees while an elder resident is home or visiting. What Is a Good Temperature for a Swimming Pool?